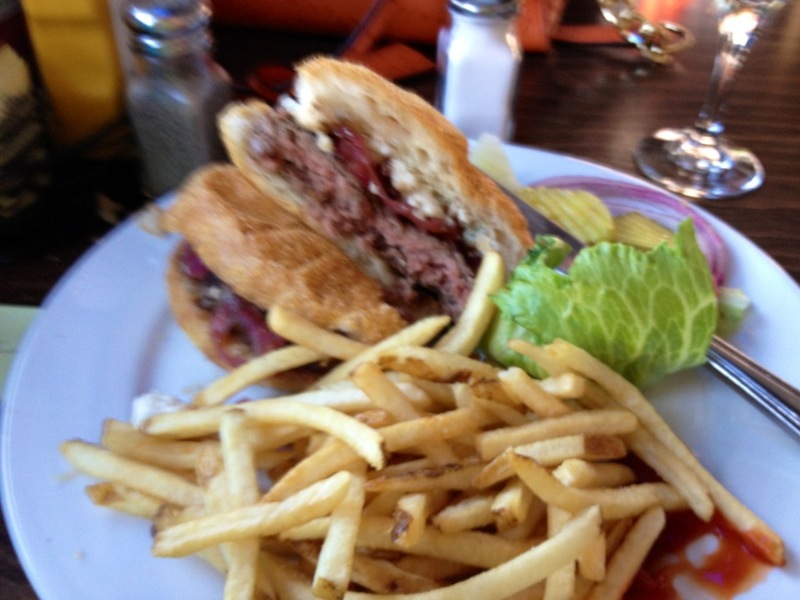 Restaurant Reviews in the Wine Country of Sonoma and Napa Counties and Beyond…..
Sally Tomatoes – American Crime! Open for five years, this corner restaurant, across the street from the Boulevard Theatres in the work/live space known as the theater district along the Petaluma River, is a diner par excellence! How I avoided this place for the past five years is a mystery to me! I love good diner food and this place rocks it. Not your typical diner with all the nostalgic cliché trappings reminiscent of “Happy Days” and the gang, it is more a nod to hip and modern, with HVAC open ceilings and ultra clean space with just enough tables and booths without feeling overcrowded. Oh, there is a short counter up at the front with a few stools if you prefer, but I like the nice booths with lots of space to spread out. On my first visit, hubby was with me and he ordered a Reuben Sando ($11 ****) corned beef, sauerkraut, 1000 Island Dressing & Swiss cheese on rye bread. Piled just high enough, this was a killer rendition. Moist meat and just enough dressing. For me, World’s Greatest Cobb ($12 ****) chicken, bacon, cheddar, crumbled bleu cheese, hard-cooked egg, avocado & tomatoes in a honey vinaigrette over iceberg lettuce. Indeed. Who am I to dispute this lofty claim? All I can tell you, it is very good and very large. A share dish, easily. On my second visit I spoke with the owner, a very nice young man with a family history spanning 50 years in Bay Area eateries. Just to mention one, his sister owns Sugo just up the street from Blu. Another restaurant on my short list to try. Now I’ll probably put it at the very top after eating at Blu! On my second visit, I was alone and decided to sit at a 2-table by the big picture window to watch the street action. The waitress was friendly and said “I’ll be right with you.” I don’t know about you, but that goes a long, long way with me. We were off to a good start. A specials board hung over the short counter area and I spotted Clam Chowder ($6 bowl / $4 cup ***) Was it housemade? Why, yes! A steaming bowl was placed in front of me with saltine crackers. I prefer oyster, but not a biggie. 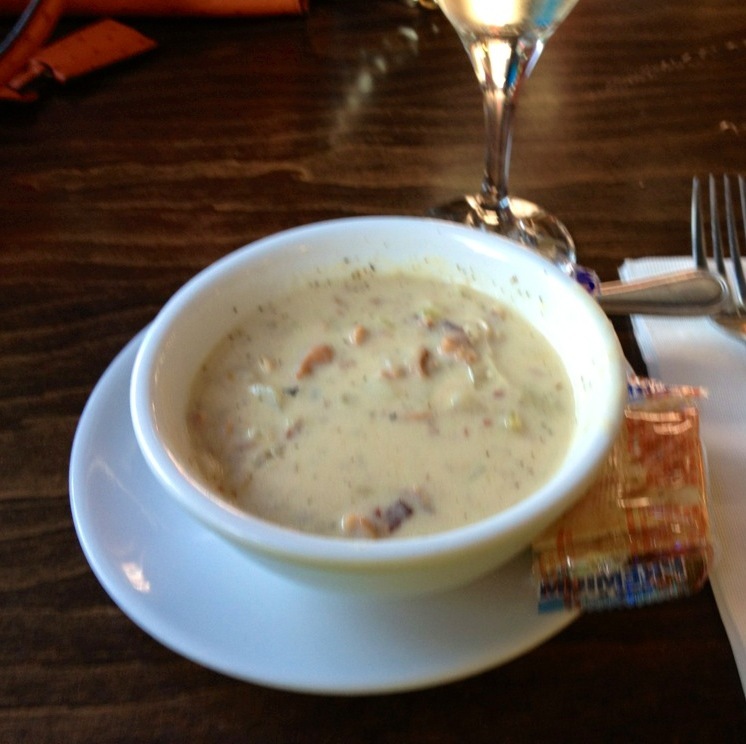 This chowder was good. White wine and thyme permeated the soup along with lots and lots of clams. Yummy! 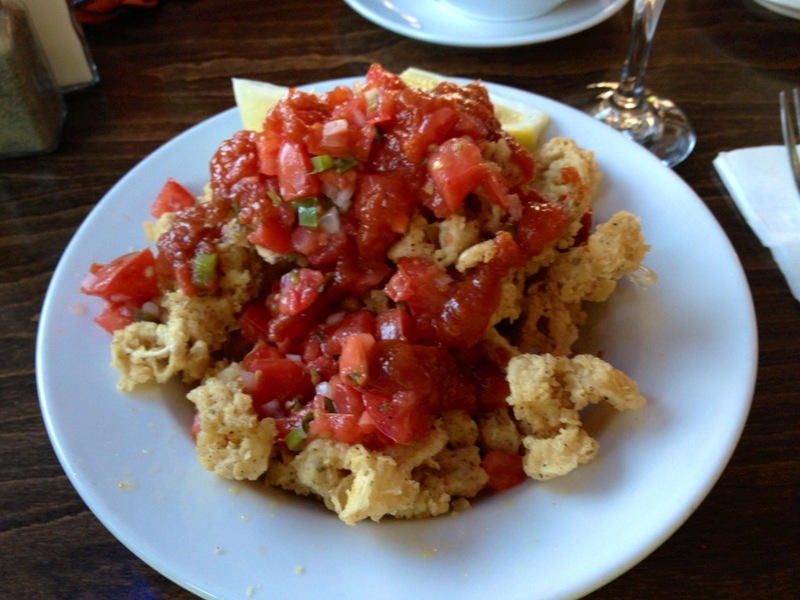 Next, Fried Calamari ($9**) extra-large portion covered in a tomato salsa. Though the color was good, indicating the oil was fresh, the fish had been overcooked and the result was a bit chewy. I liked the salsa, it had good flavor but I personally think there was too much used. Half the amount would have worked well. On to the burger. I choose their signature, Blu ($11 ****) caramelized red onion with crumbled bleu cheese. OMG. This was a killer burger and the sesame bun was wonderful. Lightly toasted, this bun compressed itself around the meat, but did not get overly soft or soggy like so many do. A definite plus. It made the burger all the more tasty. With eight (8) meat burgers to pick from and one veggie and one mushroom burger too, this place will satisfy beef and veggie types. Oh, I forgot to mention the hand-cut French fries. Nicely cut sticks of potato with bits of their skin left on, these beauties were fried up nice and crisp and properly salted after they came out of the oil. Delicious. Even though I only ate half of my burger (took rest home of course) I consumed all those tasty fries. Desert? Well, maybe just a taste! 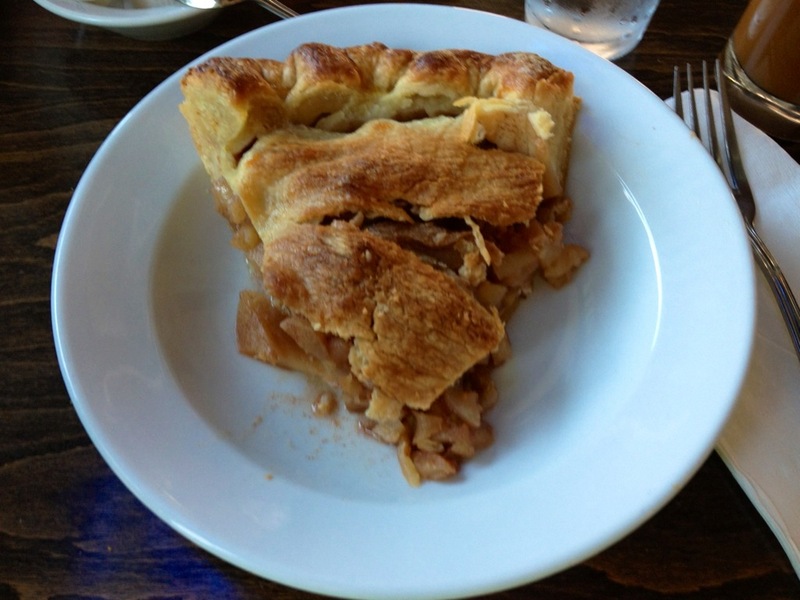 Housemade apple pie. Who could resist? BTW, if you’re into milkshakes they’ve got ’em along with root beer floats, juices and fresh squeezed OJ. I’m definitely going back for breakfast on the weekend for Lemon Ricota Pancakes or Texas Toast ($9). Get Thee to Blu Restaurant for some diner food with soul.